Feyre works hard to keep her disabled father and two older sisters fed and taken care of. She sets snares and uses her archery skills to get animals they can eat. She sells the skins in town, for what meager coins she can get. And she tries to hide the money from the sister that is most likely to spend it on new clothes she doesn’t need. While Feyre doesn’t long for the days when the family lived in their mansion, she does fondly remember painting throughout the cottage. Feyre has had to grow up and do what’s best for her family, based on a promise she made to her mother on her mother’s deathbed. I loved this partial retelling of Beauty and the Beast. I’m not normally a fae/fantasy reader, but this book completely drew me in and made me interested in seeing what was going to happen every time I turned the page. Feyre is a sympathetic character to those who have had to grow up quickly, or people who have to be resourceful out of necessity. 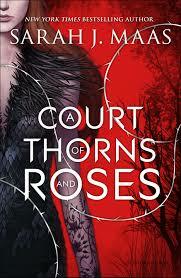 I cannot wait to read the next book in the series–it’s already in my Overdrive hold list. If you would like to support this blog at no additional cost to you, please consider buying via my paperback or Kindle link. Who would read this: ya fans, those who like fairy tales or retellings, fantasy/sci fi readers or people who like strong female main characters. Funny Story: I have the paperback, but it wasn’t until i borrowed the ebook from my library that I was able to get into it and read it. Final thoughts: I enjoyed this book much more than I anticipated–I cannot wait to read #2.